The third session of 21st Century Panglong Conference: More informal engagement than official meetings? 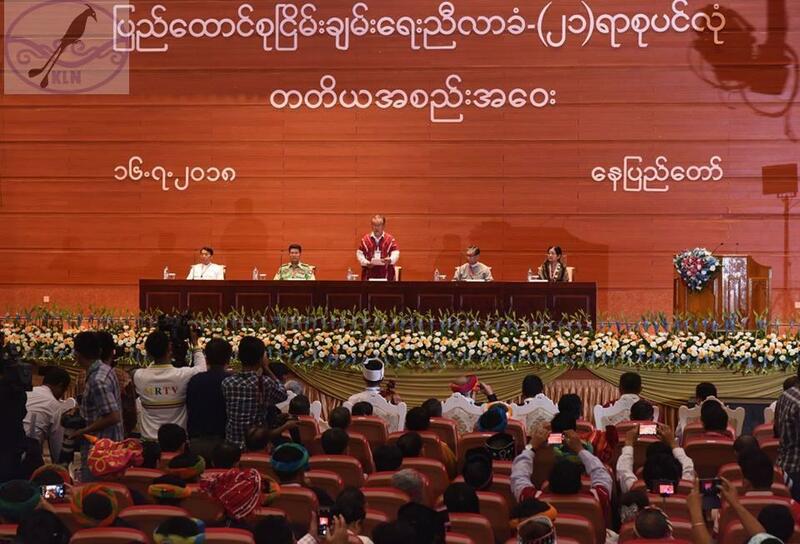 The much awaited third 21st Century Panglong, officially known as Union Peace Conference – 21st Century Panglong (UPC – 21CP) was held in Nay Pyi Taw from July 11 to 16. Actually, the first UPC, without the suffix 21CP, was conducted by the Thein Sein regime in January 2016. But when the National League for Democracy (NLD) government took over in March 2016, the renamed UPC-21CP was held in August 2016 and again in May 2017 and this is the third peace conference gathering under the NLD regime. The opening ceremony of the UPC was held at MICC-2 in Nay Pyi Taw at 10 am on July 11, with over 1,500 people including the President, ministers, leaders of ethnic armed organizations, foreign diplomats and personnel from the United Nations, delegates from China and Japan, representatives of the government, Hluttaw, the Tatmadaw, ethnic armed organizations, and political parties, experts, appropriate individuals that ought to be invited, ethnic representatives, and civil society organizations attended the ceremony. The country has been embroiled in armed ethnic conflict in ethnic states like Kachin and Shan, including to a lesser extent in Karen, Chin and Arakan (Rakhine) States, since the beginning of the year. 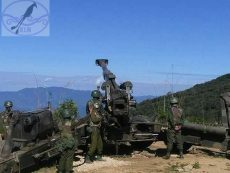 But largely died down in Kachin State and northern Shan State, with the exception of clashes in Mong Kung, central Shan State between the Restoration Council of Shan State (RCSS) and the Tatmadaw, making some 1000 fleeing their home, a dozen or so Tatmadaw’s troops killed in actions and one from the RCSS with many wounded. The Federal Political Negotiation Consultative Committee’s (FPNCC) members were all invited by the government through the good office of Chinese embassy in Myanmar; so do the Karenni People Progressive Party (KNPP) and National Socialist Council of Nagaland – Kaplang (NSCN-K), making the gathering the most all-inclusive for the first time that the Ethnic Armed Organizations (EAOs) were attending the UPC. Although the FPNCC aim was more at establishing a regular line of contact for further negotiation, on a different track, and not participating in the UPC various discussions. Against this backdrop, Union Peace Dialogue Joint Committee (UPDJC) the highest organ in giving direction to the political discussion for the UPC could only agree on 14 discussion points out of 32 proposals from the Working Committee (Secretariat) five sectors – politics, social, economy, security, land and natural environment. “NCA is a hard to attain merging equilibrium point, where different forces come together. It is an agreement that is recognized internationally as well as in the country,” she stressed. “To cease armed conflicts, it is very important to achieve political agreements that are acceptable to different forces. The National League for Democracy, that is serving as a government in accordance with the wishes of the people, firmly believed and held onto this belief since it became a party that political problems can be resolved only when a democratic federal union is established. Ethnic armed organizations also had consistently spoken of the requirement to establish a federal system for conflicts to end,” she buttressed the core aspirations of all stakeholders. She said that there are two parts in implementing the NCA — strengthening ceasefire work process and successfully holding political discussion work process. Looking at the opening speeches of Commander-in-Chief Min Aung Hlaing and the State Counselor Aung San Suu Kyi, they are almost identical in urging the remaining non-signatory EAOs to sign the NCA and enter the UPC fold. Min Aung Hlaing rejected the reasons for not inking the NCA, due to the fact that some, like the Wa, Mongla and Naga EAOs, have already sign either the state or union-level ceasefire agreements and not recently been actively engaged in conflict. He said: “To those who are saying they have already made agreements in the past and that there is no need to do so again, this may go against the current democratic ethics,” pinning his argument in his speech on the NCA ratification by the Parliament democratically, without rejection, in December 2015, during Thein Sein’s government tenure. He explicitly stressed: “That’s why all the EAOs have to sign the NCA”. He went on to explain his Myanmar’s historical background as being a political entity which has existed since time immemorial within the context of Burmese empire, rejecting the ethnic nationalities’ notion that the new political entity “Union of Burma/Myanmar” came into being because of the 1947 Panglong Agreement, which is celebrated as the“Union Day” to mark the treaty signed on 12 February 1947. He reiterated that there is no country with more than one national armed force, undercutting the demand of the EAOs to reform the Tatmadaw to become federal army. He also blamed the non-signatory EAOs for refusing to sign the NCA. The 2nd UPC-21CP in May 2017 was able to agree upon 37 guiding principles and the recent 3rd UPC-21CP on 14 points. It was agreed that the discussion points which included 4 in politics, 1 in economy, 2 in land and environment, and 7 in social sectors to be included in the 2nd part of the Union Accord, as a guiding principle for the establishment of the federal union, by all groups from the government, parliament, Tatmadaw, EAOs and political parties. The closing ceremony was conducted by the Conference Convening Committee headed by Padoe Kwe Htoo Win on Monday July 16, at 10 am, MICC-2. Following the adoption of the 14 discussion points, State Counselor gave a closing speech, where she said that although only minimum discussion points could be endorsed this time around, it is a testimony that the peace process is moving forward, despite many difficulties. The fact that the FPNCC attended the UPC opening for further collaboration in the peace process is a plus point. In trying to achieve peace, security sector agreement is vital and that all stakeholders should amend the political framework to be able to find common solution in resolving the problem. She pointed out building trust and agreeing upon common goals are necessities to achieve peace and reconciliation.. The FPNCC that flew in from China made the most headlines as eyes were fixed on this Northern Alliance, which is made up of the most EAOs’ fighting troops, estimated to field about 80% from the 100,000 or so for the whole EAO armies combined. The FPNCC met the Commander-in-Chief and State Counselor, but in two separate groups. The United Wa State Army (UWSA), Kachin Independence Army (KIA), National Democratic Alliance Army (NDAA) or Mongla and Shan State Progress Army (SSPP) met the Commander-in-Chief and the Myanmar National Democratic Alliance Army (MNDAA) or Kokang, Ta’ang National Liberation Army (TNLA) and Arakan Army (AA) met the deputy Commander-in-Chief. The same procedure was repeated also when meeting the State Counselor, except the UWSA was absent, due to its two leaders sudden illness and had to be hospitalized until they left on July 14 for China. The FPNCC delivered its position paper stating that it be allowed to amend the NCA and also a guarantee that it could opt out of the NCA when it decides to do so. The government’s Peace Commission (PC) and the FPNCC agreed to follow up with continued communication in the future. KNPP and NSCN-K participated in the UPDJC approved discussion topics during the UPC-21CP, while KNPP also continue to discuss with the government’s PC on the possibility to sign the NCA. Looking at the whole UPC-21CP that started on the July 11 and ended after six days, the formal meeting seems to be less visible and important than the informal meetings that have taken place between the FPNCC and the Commander-in-Chief and the State Counselor. The FPNCC was able to air its opinion which is the request for the amendment of the NCA, including its right to opt out of it when it decides to do so. The government in return also agreed to keep the communication line open for further discussion on peace process through its PC. The Tatmadaw met all the FPNCC members, although separately in two groups. However, the pressure and demand that the TNLA, MNDAA and AA should give up armed struggle as a precondition still exist, according to the TNLA sources. But the fact that the Deputy Commander-in-Chief Soe Win met them could be seen as improvement. In general, the assumption that the Tatmadaw is the sole organization that is entitled to represent the people doesn’t go down well for the EAOs, political parties and the NLD-led government, as could be seen by the blunt rejection of one NLD top leaders, U Nyan Win, immediately after the Commander-in-Chief’s opening speech remark on the said issue. In sum, the 10 NCA signatory EAOs and political parties were not enthusiastic after not being allowed to talk about ethnic rights and rights of self-determination and believe agreeing on discussion agendas and arguing upon words of choice in small detail could hinder the whole peace process, a prospect that has consistently dogged the whole process. As for the FPNCC, whether being able to build a cordial, working relationship with both the government and the Tatmadaw, through the good office of China’s embassy in Myanmar, might propel the peace process into a more positive light by its prospective future participation, is for now anybody’s guess.